During the great war the King's offensive was beginning to weaken - they had underestimated the Humans and the monsters they recruited. This quickly lead to the most violent period of the war, the final assault. The Kings touched various monsters with their magic, transforming them into more more formidable versions. Using them, a brigade was formed in order to aid the Kings on the battlefield. One such creature was Domigon. 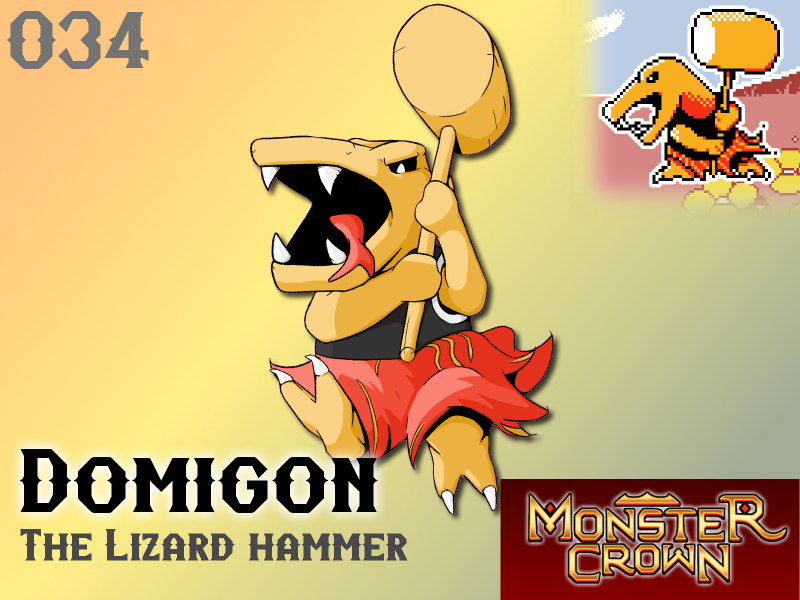 Once a weak yellow lizard, Domigon was transformed into a bipedal, toughened lizard bearing body armor and wielding a wooden battle hammer. Once the war ended the surviving Domigon formed small tribes and flourished in the Scarred region, eventually eradicating their ancestors. While modern day Domigon have no memory of the war, there are many older citizens that find their appearance disturbing, invoking horrible memories from the nation's past. Will Domigon make your team?